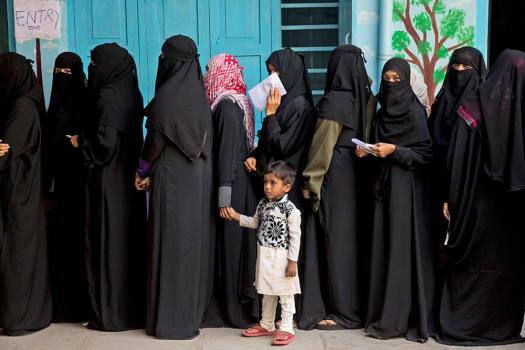 Indian Muslim women stand in a queue to cast their votes in Hyderabad. 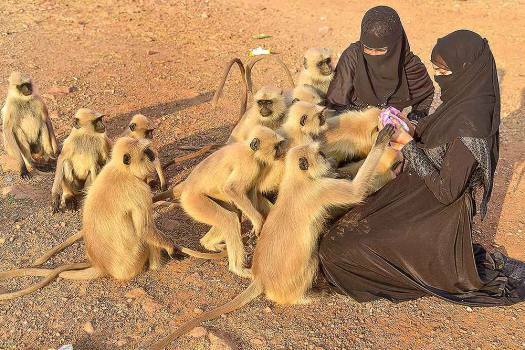 Muslim women feed a troop of langurs, in Pushkar. 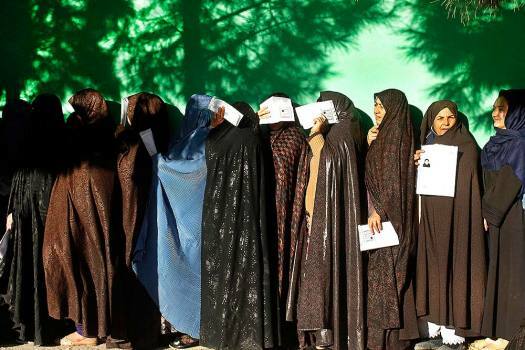 Women line up outside a pooling station during Parliamentary election in western Herat city, Afghanistan. 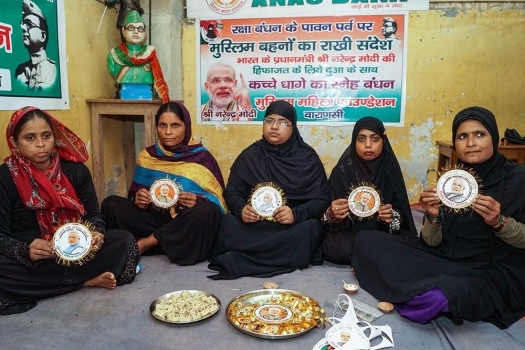 Muslim Mahila Foundation activists pose for photograph with handmade rakhis ahead of Raksha Bandhan Festival, in Varansai. 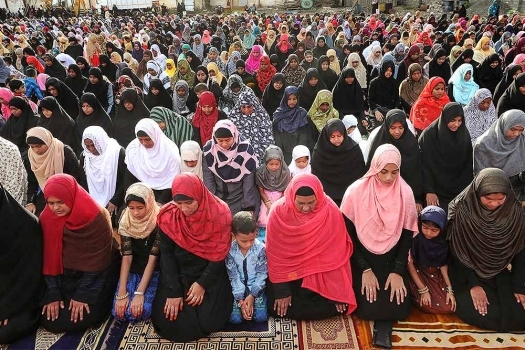 Jamiyyathul Ahlul Quran Wa Hadees (JAQH) group women members offer 'namaz' on the occassion of Eid-al-Adha festival at Ayisha Mahal ground in Coimbatore. 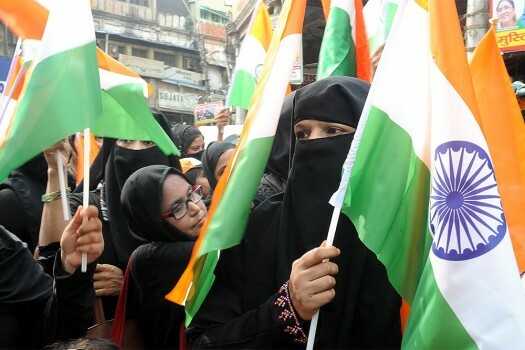 Muslim women take part in tiranga yatra at Chandni Chowk, in New Delhi. 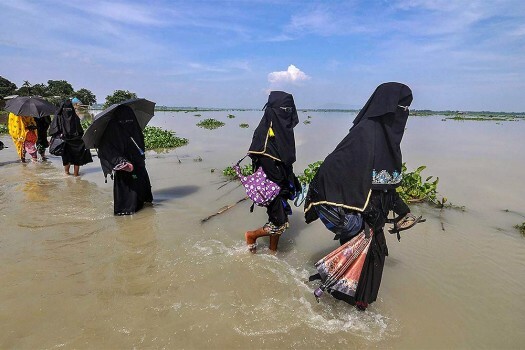 Burqa-clad women walk through flood waters at Balimukh village, in Morigaon district of Assam. 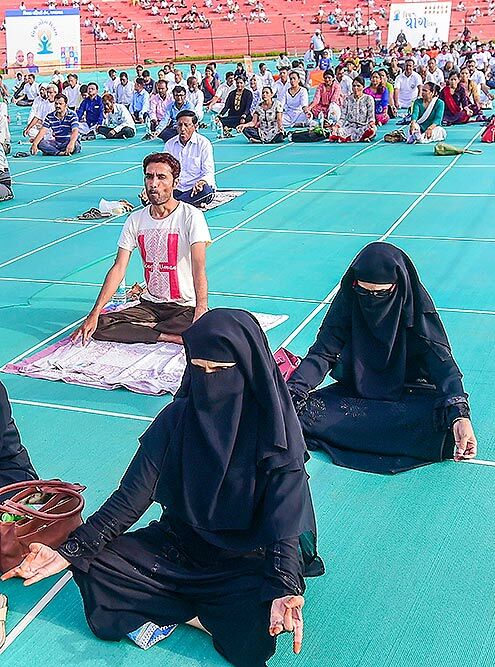 Members of Muslim Mahila Foundation perform yoga to mark the 4th International Day of Yoga (IYD 2018), in Varanasi. A students performs yoga to mark the 4th International Day of Yoga (IYD 2018) at Kanteerava stadium, in Bengaluru. People perform yoga during a programme on the 4th International Day of Yoga 2018 at Sardar Patel Stadium, in Ahmedabad. Students of Anjuman E Islam High School practice yoga ahead of International Day of Yoga 2018, in Ahmedabad. 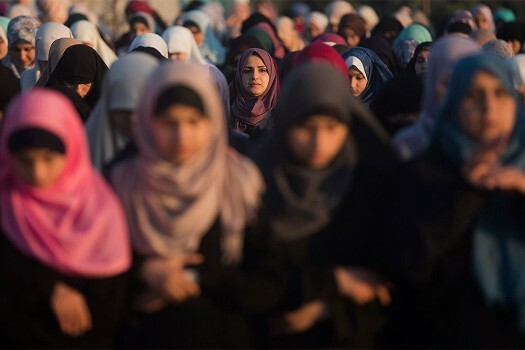 Palestinian women preform at Eid al-Fitr prayers marking the end of the holy fasting month of Ramadan, in Eastern Gaza City. 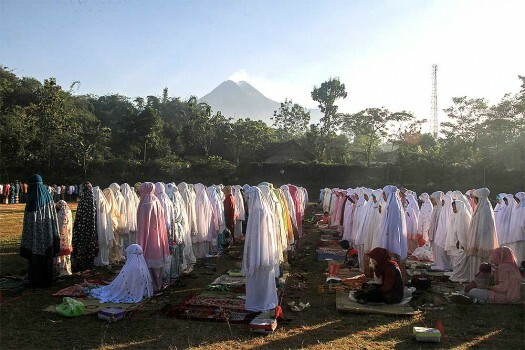 Indonesian Muslims offer Eid al-Fitr prayers to mark the end of the holy fasting month of Ramadan as Mount Merapi is seen in the background at Sleman, Yogyakarta, Indonesia. Hegde had referred to Rao on Twitter "as a guy who ran behind a Muslim lady" after the state Congress president questioned the minister about his achievements. 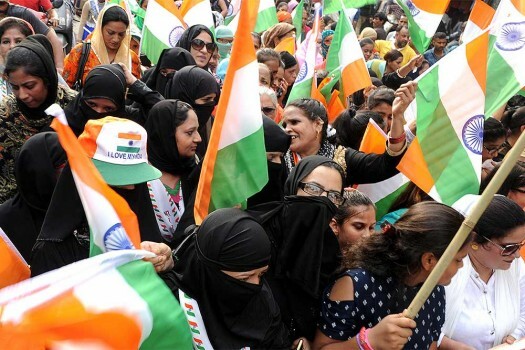 The bill is aimed to protect the rights of married Muslim women and prohibit divorce by pronouncing talaq by their husbands. 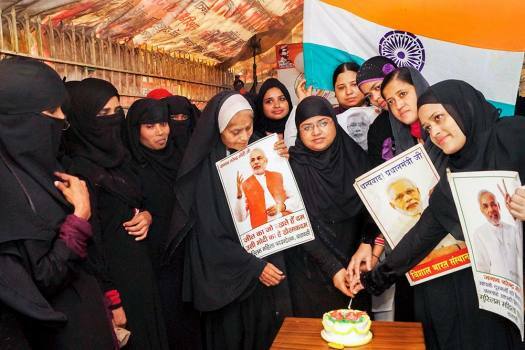 The petition, filed through advocate Kamlesh Kumar Mishra, has claimed that there is a notice put up outside the dargah -- a shrine built over the grave of a religious figure -- clearly stating in English and Hindi that women are not allowed inside. 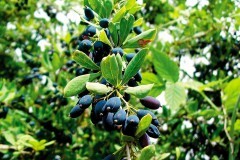 It comes as a part of Saudi Arabia's Vision 2030 reform programme. Crown Prince Mohammad Bin Salman has initiated the lifting of a number of restrictions since last year, particularly the ones on women. 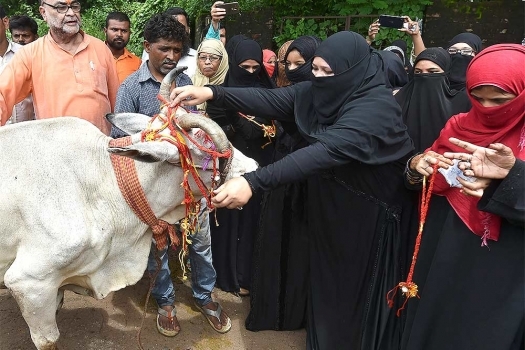 The petition has sought an interim stay on those sections of the ordinance which criminalises the act of pronouncing talaq by a Muslim husband. A bench of Chief Justice Dipak Misra, Justice A.M. Khanwilkar and Justice D.Y. Chandrachud said that they would frame the question for the consideration of the Constitution Bench. 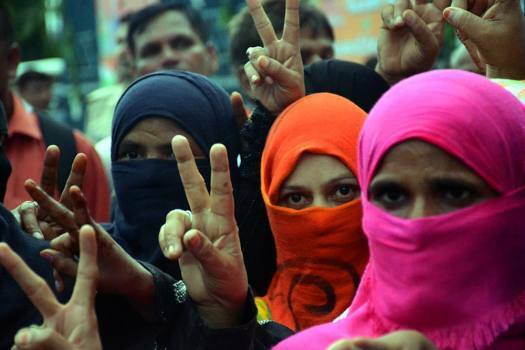 With the Union Cabinet’s ordinance, instant triple talaq is now a punishable offence with a three-year jail term. How long can 7 crore citizens of this country be ignored and discriminated against? The tide is turning. 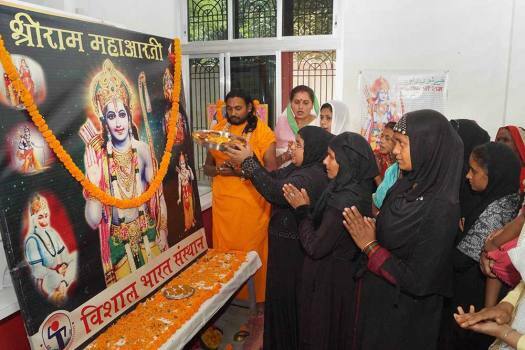 Not so very long ago, Sabarimala would have been an unknown entity outside Kerala. 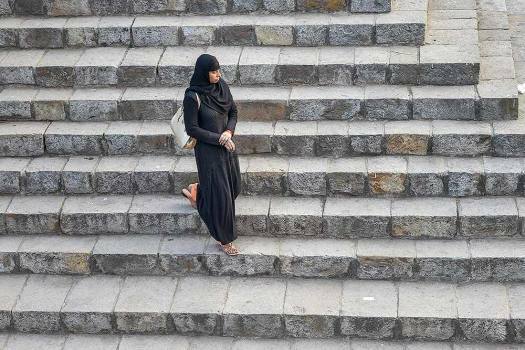 Now, this debate over gender bristles with implications on a host of questions relating to society, politics, law and religion across India.